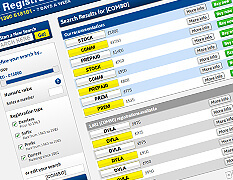 Use the SEARCH BOX to establish if your selected registration is available. Once you reach a decision to buy, proceed to Step 2. When you have found a registration, simply click the 'Buy now' button and you can begin our simple purchasing process where we will ask you for your details and also your payment details. Once you have completed the buying process and you are ready to transfer the registration to a vehicle, you will be provided with an online transfer facility or alternatively we can conduct the transfer via the post. In both cases we will be conducting the transfer procedure through The Dept. for Transport. At the point of transfer, or before, you will have the option to purchase acrylic number plates from us. We are a Dept. for Transport registered number plate supplier (reg'n no. 553), meaning that we are able to supply you with high-quality number plates for your new registration. However, you can just as easily purchase a set of number plates from any other registered supplier (Halfords, for example). Once you receive your V5C Vehicle Registration Certificate from the Dept. for Transport showing your new registration number, you can start displaying the number plates on your vehicle and you should inform your insurance company of the change of registration number.